Laos is a landlocked country, there’s no denying that. However, that doesn’t mean you can’t get some quality relaxation time on the water. For nearly the entire length of the country, the Mekong River runs its course from Tibet to the South China Sea. While millions of people live along this river and rely on it for their very lives, there are also several opportunities for traveler’s to rest their weary feet. Just across the Lao border from Cambodia lies the area known as Si Phan Don to locals, but better known to travelers as 4,000 Islands. 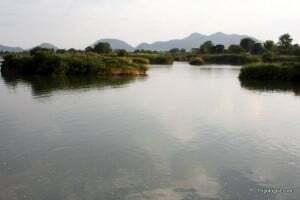 While most of the islands are no more than small sandbars during the dry season, there are several inhabited islands among the Mekong’s 14-kilometer breadth. Of these, the most popular with traveler’s are Don Dhet and Don Khon. 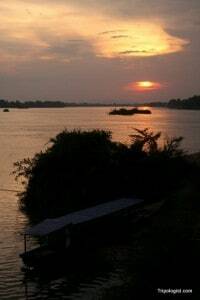 The sun sets over the Mekong River on Don Dhet in Laos. 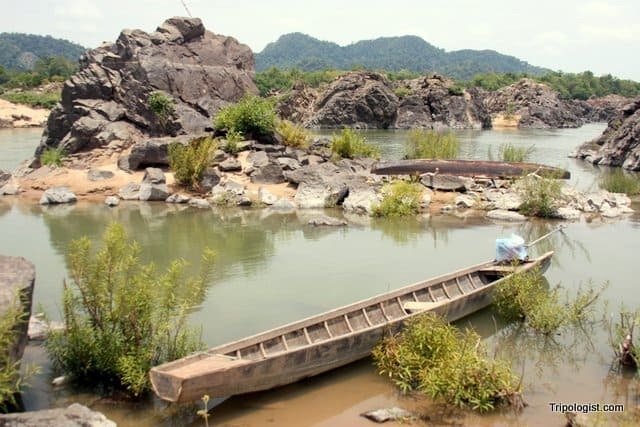 Seperated by a small channel, but connected by an old French railway bridge, the two islands are fairly easy to reach from any point in southern Laos or northern Cambodia. Once you reach the islands, there is as much or as little as you want to occupy your time. Should you chose to be busy, you can rent a kayak or inner tube to float down the river, or you can rent a bike to explore the islands a bit further. When I was there recently, I chose to rent a bike and headed over to Don Khon from my hotel on Don Dhet. I had a wonderful day riding through the old villages on the islands, following old railway trails, looking for dolphins in the river, and watching water roar over a waterfall. It was a great way to see a bit of life in rural Laos fishing villages. On the other hand, no trip to 4000 Islands would be complete without a day spent lounging in a hammock, cold Beer Laos in hand, waiting until you get just toasty enough to cool off with a swim in the mighty Mekong. Whether you want to stay for 1 night or for 10 nights, make sure to get to Si Phan Don soon, as it is quickly changing. While I was visiting, there was a constant hum of hammers and saws as new, larger hotels and guesthouses were being built. In my opinion, most of the charm of 4000 Island is that you can relax on the riverside for mere dollars a night, while still being able to enjoy some traveler friendly food, and biking through villages that have changed little in the last 100 years. However, once the large and nicer guesthouses open, I suspect that these islands will start to lose a lot of their charm. Crowds will take over the quiet riverside, restaurants will serve you food after 9pm, and the wifi might become even faster. While progress is always good, there is something nice about the tranquility you can experience at Si Phan Don. Make sure to get there before that goes away forever. As I only got to explore Northern Laos I never made it down to the 4000 Islands. It sounds right up my alley though so I will definitely make it there on my next trip. 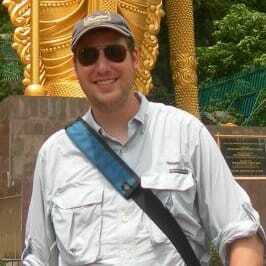 I’m excited to get to northern Laos, but am really enjoying my time in the southern part of the country. Thanks for the comment. I have been wanting to go to the 4000 Islands for a while, but I have also heard that is is not a sleepy as it used to be. Now I have read your post though I might try and get there before it gets worse. Do you happen to know if there is public transport from the 4000 Islands to Cambodia? 4000 Islands is a must see before it gets too crazy. I really enjoyed it a lot. You can get a bus from 4000 Islands to Cambodia every morning. While you can go all the way to to Phnom Penh or Siem Reap, I would recommend a stop in Kratie to see the dolphins. Great, thanks for the tip. I’ll give it a go. You made me that I had to visit there before too late, it sounds really cool and i am so happy I can feel about Lao from you. Thanks!